Through Orient DC Inverter Air Conditioners SR0011980 your electricity bill will be decreases, because Orient inverter series AC consumes electricity equal to 80 watt bulb. 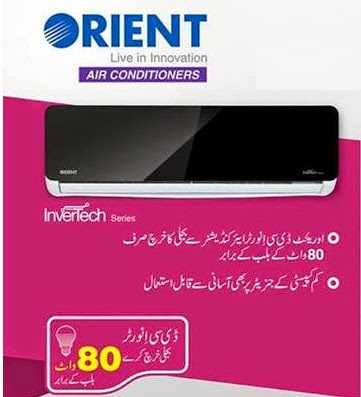 New Orient inverter series AC also works on low capacity Generators these AC specially design for Pakistani customers where electricity issue is on peak in summers. Inner Grooved Copper Tube Technology.